I can’t take credit for the bread part of this Orange Swirl Coconut Bread, that is thanks to a Whole Foods recipe which I have tweaked for British kitchens, into grams etc. But the orange swirl was my idea. I’d made a banana bread with a strawberry swirl just over a year ago and thought that this combo would work just as well. I was very surprised at how good the bread on it's own was. Very light and mildly sweet from the coconut. But you know how I love to mess with things and so thought that adding orange jam in the centre would be a bonus. I spread on some shredless sweet orange marmalade (regular marmalade would work just as well) and sprinkled on some brown sugar. In fact this was a bit like making the Dundee Marmalade Sticky Buns I made last year. Anyway, I tightly rolled the bread and placed it into the loaf tin. The baked result had to be left to cool completely else it falls right apart. I froze some of my loaf to see what it would be like toasted ( I thought placing the fresh bread in the toaster might have been a bit precarious). And overall, the toasted bread was even better than fresh bread. But I urge you to give this a try and have it both fresh and toasted. You will LOVE it! In a bowl, place the desiccated coconut, granulated sugar, warm water, and yeast and stir to combine, then leave for 10 minutes to become active. In a separate bowl, sift the flour and salt together. Add the yeast mix and with your hands combine until dough forms. If it’s a little sticky add a bit more flour. On a floured work surface, knead the dough for 10 minutes then place into a lightly greased bowl, covered with a tea towel. Leave to prove for an hour and a half in a warm area. After it has proved (it will have doubled in size) tip it back onto a floured work surface and spread out to an oblong about 30 cm wide and 1 cm thick (approximately!). Spoon the marmalade on and gently spread out with a knife. Then sprinkle the brown sugar on top. Lastly, roll the loaf up tightly, like you would a Swiss roll. Place into a regular sized loaf tin and let rise again for 1 hour, covering with the tea towel. Preheat the oven to 180C and after the hour, place the loaf in the centre of the oven to bake for 40 to 45 minutes. Remove from the loaf tin immediately and leave to cool completely, on a rack. 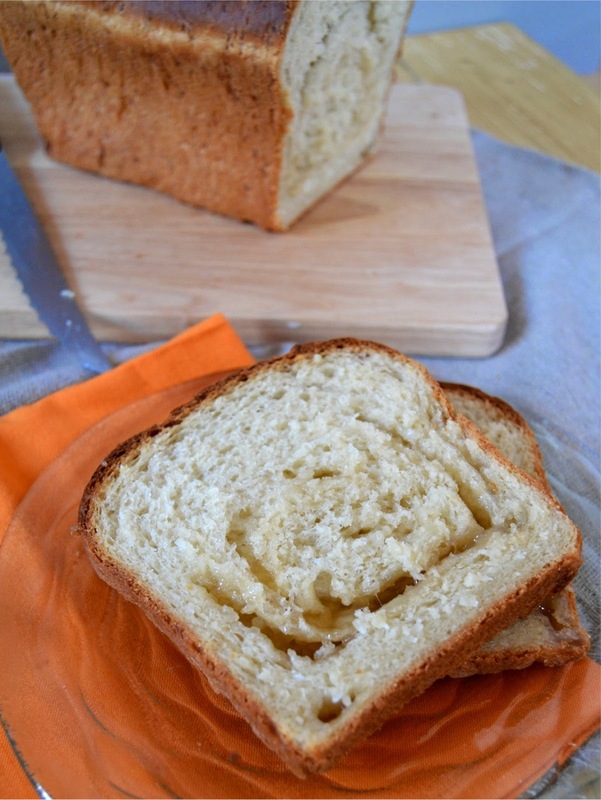 Slice the bread and each slice sort of unfurls into a sticky delicious treat. And like I say, if you have any leftover, freeze it and toast from frozen (if your toaster has that setting). It is delicious – TRUST ME – and enjoy! Rainbow swirl - what the heck flavour was that?? I love those flavours. Time to dig out the marmalade I think. I love this cake ! look amazing!!! I want a piece with a cup of tea please!! Yes, it'd be perfect with a cuppa Gloria! Oh what a fun bread to make. I will try and do some swirl bread with the mini chefs. I have a few more ideas up my sleeves for swirl breads Bintu! Lovely idea, one for saving in my To Do list! Love anything coconut - this looks lush! The bread on it's own was very good CC, if you wanted to leave out the marmalade. Love the idea of combining these two flavours! I can imagine it warm with a smear of salted butter... Mmmm! Oh yes, butter on top was good!! This looks wonderful. Love the swirl and the bread has an almost brioche-like appearance to it. Trying to get my head around how I might make a GF version!! !